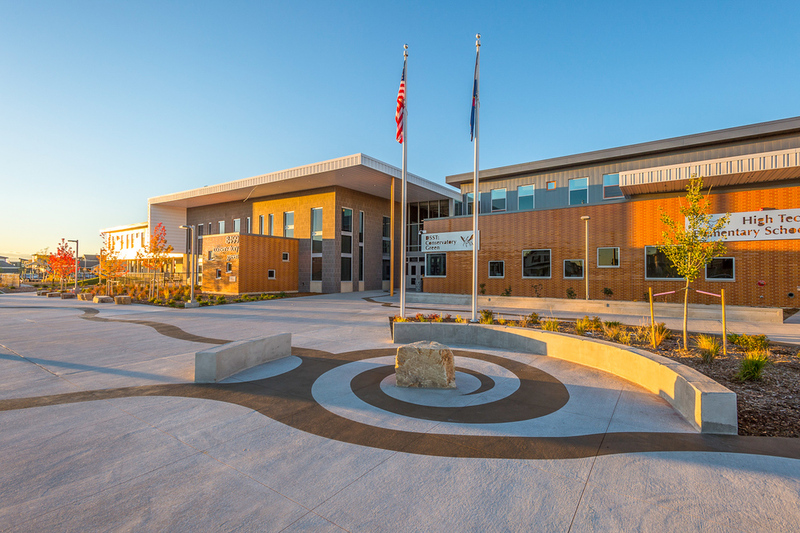 Stapleton Denver Public Schools Colorado Conservatory Green Learning Landscape outdoor nature discovery themed school of Science and Technology with synthetic turf, nature play, outdoor exploration, custom playground, and an educational maze. 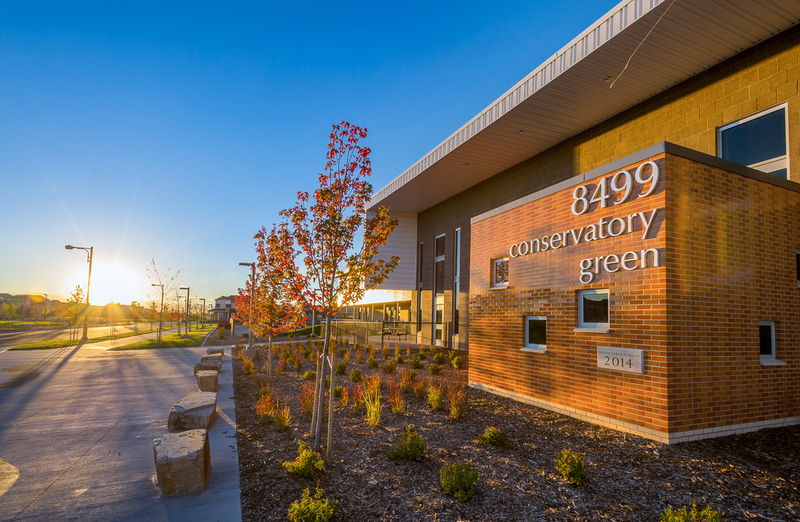 Conservatory Green is a shared school campus for two Denver Public School of Science and Technology schools: Conservatory Green Middle School and High Tech Elementary School. This Learning Landscape combines colors, patterns and textures of animals, insects and vegetation found in nature. 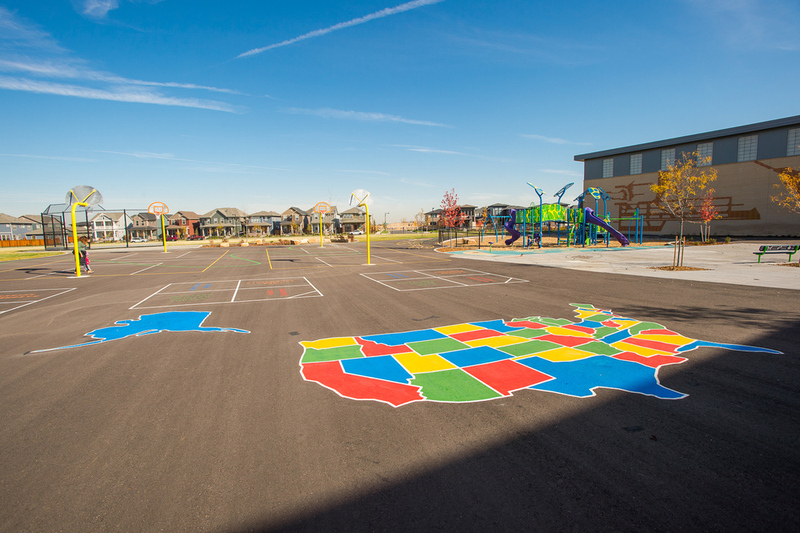 Special design features include integrating fun and colorful educational symbolism like a butterfly life cycle walkway, a U.S. map painted on asphalt, nature-themed play equipment with dragonfly-like patterns, abstract insect forms embedded into play pits, and a flight path of a bee integrated into an outdoor adventure area. QR codes etched into a maze integrated the learning components. The animal and nature theme is interwoven throughout the site. A discovery area is themed around plant life and includes an outdoor classroom with a tactile walk. At the main entry plaza, etched water patterns provide a visual progression typically found in a watershed. 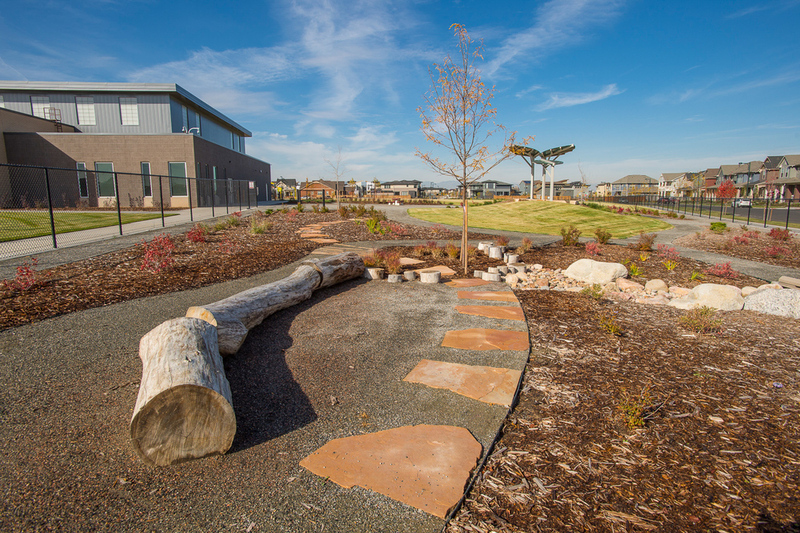 There is an outdoor exploratory area with natural materials, and numerous native plantings. 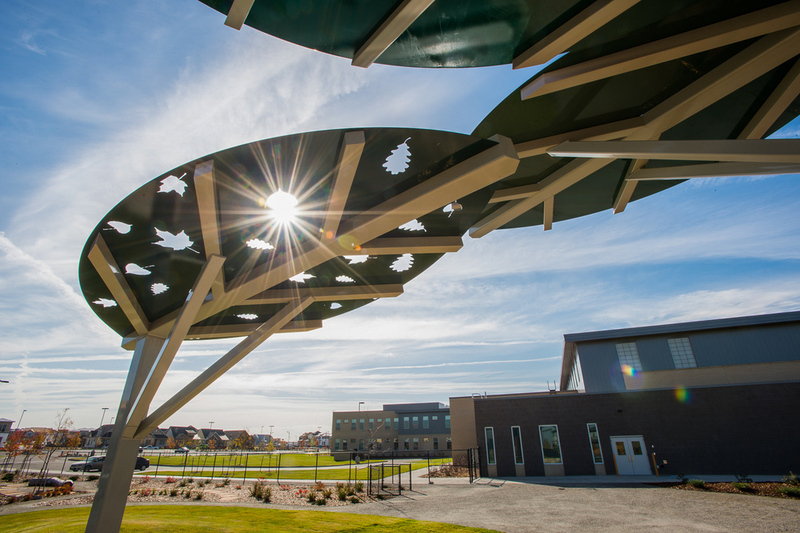 These include a buff sandstone amphitheater with shade structures featuring leaf cutouts, a large cottonwood stump that creates a picnic table and seats, and a footbridge which crosses a cobble stream bed. Etched stepping stones are embedded in the crushed gravel walkways, and a pathway of tree stumps forms an adventurous balance walk. 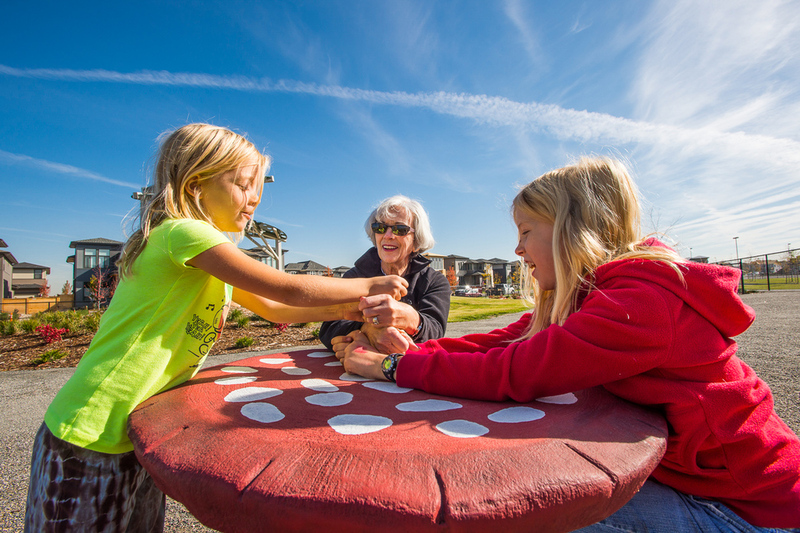 The Kitchen Community designed and installed whimsical, macaroni shaped garden beds for hands-on learning experiences. 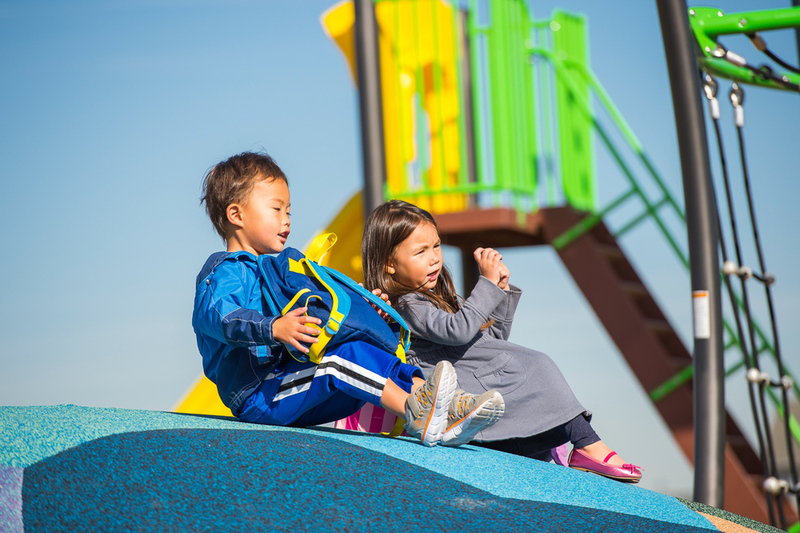 The landscape design also includes common amenities appropriate to a school site, including outdoor recreation and play fields, open spaces, and plazas to include the community, along with carefully planned parking and student drop-off and pick-up zones and bus access. The parking lot contains a porous landscape detention island to help clean surface runoff before entering nearby drainage ways.